Clear a path for National Trails Day this Saturday - GetGoing NC! 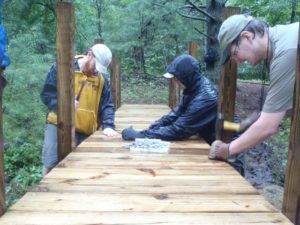 Volunteers build a bridge on the Mountains-to-Sea Trail. Saturday is National Trails Day, a day set aside for us to appreciate the more than 200,000 miles of trail in the U.S. Officially, National Trails Day dates back to 1991, when the American Hiking Society deemed that one day a year be set aside to honor our trails; the first NTD, however, didn’t occur until June 5, 1993. Over the years, we’ve increasingly embraced the concept of NTD. Last year, more than 2,000 events were held drawing more than 157,000 participants. Some events are workdays, intended to spruce up existing trails or blaze new ones. Other events celebrate our trails by encouraging us to use them, while still others have more of an educational bent. The 25 NTD events scheduled in North Carolina for this Saturday reflect that mix. 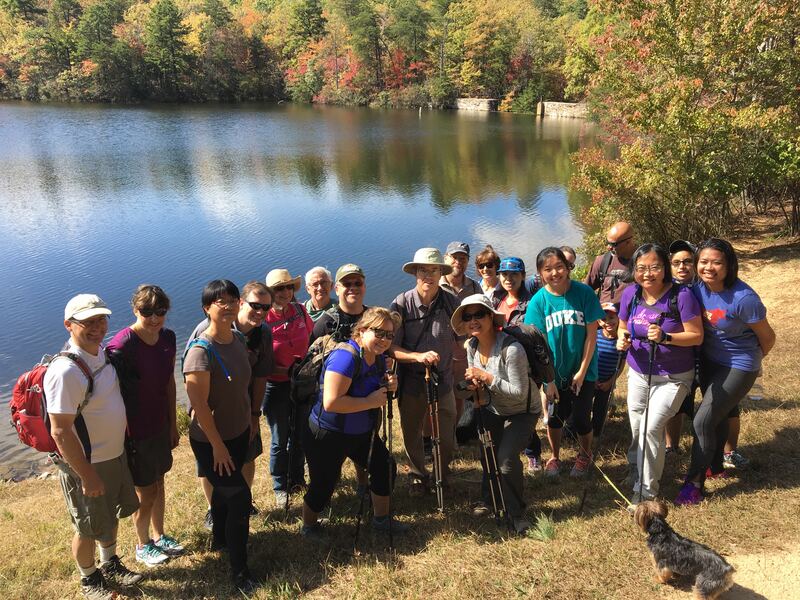 In the Triangle, for instance, the Friends of the Mountains-to-Sea Trail will work to link 60 miles of MST along Falls Lake with bout 10 miles along the Eno River (see No. 2 under Piedmont). 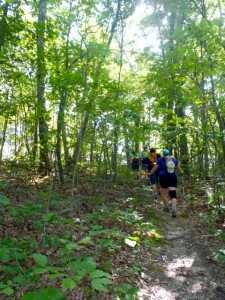 Likewise, NTD volunteers will work to build the new Beech Tree Trail at Elk Knob State Park (No. 3, Mountains) and to add to the ambitious 12-mile Trombatore Trail which will link various features in the Upper Hickory Nut Gorge (No. 9, Mountains). 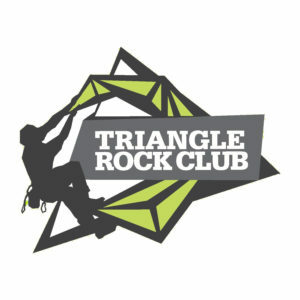 They’ll be doing trail maintenance at Hanging Rock State Park (No. 12, Piedmont) and on the Carolina Thread Trail (Nos. 10, 11, Piedmont); they’ll be dedicating new trail in Cary (No. 3, Piedmont) and in Panthertown Valley (No. 5, Mountains); and they’ll be celebrating in all kinds of ways in Greensboro (No. 4). We’ve compiled a list of the 25 National Trails Day events reported to the American Hiking Society. (We suspect there are more; if you know of one, let us know about it and we’ll add it to the list.) Scope out our list, then plan to show your favorite trail some love on Saturday. When: Saturday, 8 a.m.-2 p.m.
Workday on the Loop and Wolf Rock trails, plus a kid’s activity. When: Saturday, 9 a.m.-4 p.m.
9-mile hike on the AT with the Nantahala Hiking Club. More info: wavh@dnet.net, 828.369.1983 or here. When: Saturday, 9 a.m. – 3:30 p.m.
Help build the new Beech Tree Trail at Elk Knob. Workday on the Boone United Trail, a 2.5-mile trail that’s about a mile finished. More info: eric.heistand@cru.org, 828.773.6632 or here. When: Saturday, 9:30 a.m.-3 p.m.
5-mile hike and trail dedication. More info: friends@panthertown.org, 828.269.4453 or here. When: Saturday, 10 a.m.-1:30 p.m.
More info: jrkautz@frontier.com, 828.524.6593, or here. When: Saturday, 10 a.m.-1 p.m.
Cleanup of the Cascades Parking area, followed by a hike on the Mountains-to-Sea Trail. When: Saturday, 9 a.m.-3 p.m.
Work on the new Trombatore Trail, a 12-mile work in progress that will join Bearwallow Mountain, the Florence Nature Preserve, Blue Ridge Pastures, Wildcat Rock, Wildcat Rock, Little Bear Wallow Cliffs and Ferguson Peak in the Upper Hickory Nut Gorge area. More info: peter@carolinamountain.org, 828.697.5777 or here. Various maintenance projects on the 60-mile stretch of the MST along Falls Lake. When: Saturday, 9 a.m. – 4 p.m. Trail construction to join existing trail along Falls Lake with that along the Eno River, to create more than 70 miles of continuous trail. More info and to RSVP: fred.dietrich@duke.edu or here. More info: paul.kuhn@townofcary.org, 919.469.4061, or here. A celebration of all trails, with various hikes, mountain bike rides, clinics, Living Green Expo and more. More info: GSOTrails@greensboro-nc.gov, or here. When: Saturday, 8 a.m.-5 p.m. Hike, bike or horseback ride one of various designated routes; complete the route (there’s a backcountry check station) and win an award. Trail races of 2K, 6K and 11K. More info: mike@goruntrails.com, 864.907.1742 or here. Organizer: Historic Gold Hill and Mines Foundation, Inc. When: Saturday, 9 a.m.-1:30 p.m.
5-mile hike through Gold Hill Mines Historic Park, with history along the way. 3-mile hike on paved greenway. More info: bflournoy@nc.rr.com, 919.828.8322 or here. 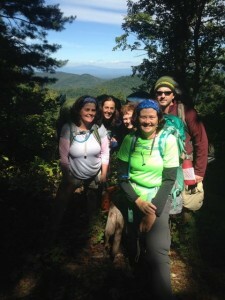 4-mile interpretive hike along portions of the Ridge, North River Loop and Homestead trails. More info: littleriverpark@orangecountync.gov, 919.732.5505 or here. Workday focusing on the Sally’s YMCA Trail in Denver. More info: vanessa@carolianthreadtrail.org, 704.376.2556 or here. Workday to complete the 2.5-mile trail at Buffalo Creek Preserve. When: Saturday, 10 a.m.-2 p.m. Trail maintenance on the new River Bluffs Trail or the Indian Creek Trail. More info: samuel.koch@ncparks.gov, 336.593.8480 or here. Leave-no-trace presentation by the scouts followed by a trail cleanup. Organizer: While the Chapel Hill Library in Pritchard Park has reopened, the surrounding trail system has not. That’s the goal of this workday. More info: bwebster@townofchapelhill.org, 919.968.2819 or here. Trail maintenance and 10-mile horseback ride. More info: bpwillett@centurylink.net, 910.690.7500 or here. Work on the New Hope Creek Bottomlands Trail will focus on building 150 to 200 feet of boardwalk. Pingback: Give a little, get a lot | GetGoing NC!